The Tibesti Mountains are named for the Toubou people, also written Tibu or Tubu, that inhabit the area. In the Kanuri language, tu means "rock" or "mountain" and bu means "a person" or "dweller," and thus Toubou roughly translates to "people of the mountains"[a] and Tibesti to "place where the mountain people live." 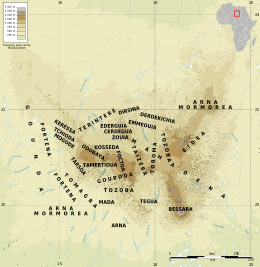 The highest peak in the Tibesti Mountains, as well as the highest point in Chad and the Sahara Desert, is the 3,445-metre (11,302 ft)[b] Emi Koussi, located at the southern end of the range. Other prominent peaks include Pic Toussidé[c] at 3,296 m (10,814 ft) and the 3,012-metre (9,882 ft) Ehi Timi on its western side, the 2,972-metre (9,751 ft) Tarso Yega, the 2,925 m (9,596 ft) Tarso Tieroko, the 2,849-metre (9,347 ft) Ehi Mousgou, the 2,845-metre (9,334 ft) Tarso Voon, the 2,820-metre (9,250 ft) Ehi Sunni, and the 2,774-metre (9,101 ft) Ehi Yéy near the center of the range. The 2,978-metre (9,770 ft) Mouskorbe and the 2,812-metre (9,226 ft) Kegueur Terbi are two peaks notable for their height in the northeastern part of the mountain range. The 2,267-metre (7,438 ft) Bikku Bitti, the highest point in Libya, is nearby, on the other side of the border. 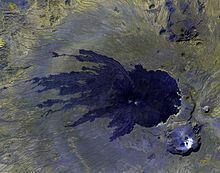 The average elevation of the Tibesti Mountains is about 2,000 metres (6,600 ft); sixty percent of its area exceeds 1,500 m (4,900 ft) in elevation. In 1957, P.R. Steele, R.F. Marks and W.W. Tuck of the University of Cambridge embarked on an expedition to Tarso Tieroko, which Thesiger had described as "probably the most beautiful peak in Tibesti," and which offered an interesting climbing opportunity. 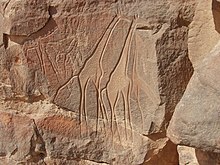 They started at the wadi Ybbu Bou and hired guides and camels for the three-day journey. Following a week of exploring the southern flank of the mountain and climbing the two peaks situated on a ridge to the north,[d] they attempted to summit Tieroko from their camp at Wadi Modra. After ascending to an elevation of 3,200 m (10,500 ft), just 61 m (200 ft) from the summit, they were faced with a vertical, crumbling rock wall, and thus were forced to descend. Following this defeat, they took the opportunity to climb Emi Koussi, 19 years after its first ascent by Thesiger, and also Pic Woubou, a prominent spire located between Bardaï and Aozou. Although gold was long known to exist in small quantities, substantial deposits were discovered in 2012. Diamonds and emeralds have also been found. The mountains and their surroundings could contain significant quantities of uranium, tin, tungsten, niobium, beryllium, lead, zinc, copper, platinum, and nickel. The natron extracted from Trou au Natron on Tarso Toussidé is used as a food supplement for animals. The Soborom geothermal field, the name of which means "water cure," is known to locals for its medicinal qualities; the 42 °C (108 °F) pools are rumored to cure dermatitis and rheumatism after several days of soaking. The Yerike hot spring is rich in natural gas; its water temperature ranges between 22 and 88 °C (72 and 190 °F). ^ An alternative theory holds that the name Toubou means "bird," because members of the Toubou communicate by whistling or because they run fast; however, it is unlikely that this theory is valid. ^ Although the official elevation of Emi Koussi is listed by the Institut Géographique National at 3,415 m (11,204 ft), data from the Shuttle Radar Topography Mission suggests the peak is in fact 3,445 metres (11,302 ft). ^ Pic Toussidé is the highest point on the high plateau Tarso Toussidé. ^ The two peaks are "The Imposter" and "Hadrian's Peak." ^ a b Room, Adrian (2006). Placenames of the World (2nd ed.). McFarland. p. 375. ISBN 978-0-7864-2248-7. ^ Shoup, John A. (2011). Ethnic Groups of Africa and the Middle East: An Encyclopedia. ABC-CLIO. p. 284. ISBN 978-1-59884-362-0. ^ a b c d e f g h i j Permenter and Oppenheimer 2007, p. 611. ^ Salam, M. J.; Hammuda, Omar S.; Eliagoubi, Bahlul A. (1991). The Geology of Libya, Volume 5. Elsevier. p. 1155. ISBN 978-0-444-88844-0. ^ Sola, M.A. ; Worsley, D., eds. (2000). Geological Exploration in Murzuq Basin. Elsevier. p. xi. ISBN 978-0-08-053246-2. ^ a b Auzias, Dominique; Labourdette, Jean-Paul (2006). 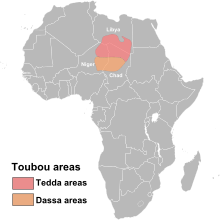 Tchad [Chad] (in French) (2nd ed.). Petit Futé. p. 22. ISBN 978-2-7469-1124-6. ^ a b c d e f g h i j k l m n Beauvilain 1996, p. 15–20. ^ a b Braquehais, Stéphanie (February 14, 2006). "Bardaï, village garnison au cœur du désert" [Bardaï, village garrison in the heart of the desert]. Radio France Internationale (in French). Archived from the original on February 18, 2011. ^ a b c d e f g h Roure 1939. ^ a b Bearman, P.J. ; Bianquis, Th. ; Bosworth, C.E. ; van Donzel, E.; Heinrichs, W.P. (2005). Encyclopédie de l'Islam [Encyclopedia of Islam] (in French). Brill. ISBN 978-90-04-13951-0. ^ Gourgaud and Vincent 2004, p. 261. ^ a b c d e f Permenter and Oppenheimer 2007, p. 609. ^ a b c d e f g h i j k l m n o p q r s t u v w x Hughes and Hughes 1992, p. 1–3. ^ a b c Grande Encyclopédie 1979, p. 2262. ^ "Africa Ultra-Prominences". Peaklist. December 3, 2011. Archived from the original on November 9, 2012. ^ a b c d e f Permenter and Oppenheimer 2007, p. 615–616. ^ "MousKorbe". Peakery. Archived from the original on 2013-05-21. ^ "Kegueur Terbi". Peakery. Archived from the original on 2013-09-22. ^ Permenter and Oppenheimer 2007, p. 620–621. ^ Permenter and Oppenheimer 2007, p. 622. ^ a b c d e f g h Permenter and Oppenheimer 2007, p. 619. ^ Permenter and Oppenheimer 2007, p. 614. ^ a b c d e f g h i j k l m n o p q r s t u v w x Hughes and Hughes 1992, p. 18–20. ^ Chapelle 2004, p. 67. ^ a b c d e f Grande Encyclopédie 1979, p. 2263. ^ Getty Doby 2007, p. 8. ^ a b "Emi Koussi". Global Volcanism Program. ^ "Emi Koussi: Synonyms and Subfeatures". Global Volcanism Program. ^ a b c d "Soborom". Wondermondo. Archived from the original on January 19, 2013. ^ Pegram, W.J. ; Register, J.K., Jr.; Fullagar, P.D. ; Ghuma, M.A. ; Rogers, J.J.W. (1976). "Pan-African ages from a Tibesti Massif batholith, southern Libya". Earth and Planetary Science Letters. 30 (1): 123–128. Bibcode:1976E&PSL..30..123P. doi:10.1016/0012-821X(76)90014-5. ^ a b c Permenter and Oppenheimer 2007, p. 616. ^ El Makkrouf, Ali Ahmed (1988). "Tectonic interpretation of Jabal Eghei area and its regional application to Tibesti orogenic belt, south central Libya (S.P.L.A.J.)". Journal of African Earth Sciences (and the Middle East). 7 (7–8): 945–967. Bibcode:1988JAfES...7..945E. doi:10.1016/0899-5362(88)90009-7. ^ Suayah, Ismail B.; Miller, Jonathan S.; Miller, Brent V.; Bayer, Tovah M.; Rogers, John J.W. (2006). "Tectonic significance of Late Neoproterozoic granites from the Tibesti massif in southern Libya inferred from Sr and Nd isotopes and U–Pb zircon data". Journal of African Earth Sciences. 44 (4–5): 561–570. Bibcode:2006JAfES..44..561S. doi:10.1016/j.jafrearsci.2005.11.020. ^ a b Permenter and Oppenheimer 2007, p. 620. ^ Permenter and Oppenheimer 2007, p. 621. ^ Leenhardt, Olivier (2000). La catastrophe du lac Nyos au Cameroun [The Lake Nyos Disaster in Cameroon] (in French). L'Harmattan. p. 170. ISBN 978-2-7384-3690-0. ^ Ceuleneer, Georges; Genthon, Pierre; Grégoire, Michel; Monnereau, Marc; Ormond, Anne; Rabinowicz, Michel; Toplis, Mike (2006). "Pétrologie et géodynamique comparée". Rapport d'activité 2002–2005 de l'UMR5562 et prospective 2007–2010 [2002–2005 Activity Report of UMR5562 and 2007–2010 Prospective] (PDF) (in French). Laboratoire Dynamique Terrestre et Planétaire. p. 87. Archived from the original (PDF) on 2013-11-04. ^ Kochemasov, G.G. (2007). "The Cameroon line: its regularities and relation to African rifts". Global Tectonics and Metallogeny. 9 (1–4): 67–72. ISSN 0163-3171. ^ a b c d e f g h Permenter and Oppenheimer 2007, p. 617–619. ^ Cheminée, Jean-Louis (1996). Les Volcans [Volcanoes] (in French). Chamalières. p. 113. ISBN 978-2-7344-0757-7. ^ "Tarso Toussidé". Global Volcanism Project. ^ a b Hagedorn, H. (1997). "Tibesti". In Tillet, Thierry (ed.). Sahara : paléomilieux et peuplement préhistorique au Pléistocène supérieur [Sahara: paleoenvironments and prehistoric populations in the Upper Pleistocene] (in French). L'Harmattan. pp. 267–273. ^ Soulié-Märsche, I.; Bieda, S.; Lafond, R.; Maley, J.; M'Baitoudji, M.; Vincent, P.M.; Faure, Hugues (2010). "Charophytes as bio-indicators for lake level high stand at "Trou au Natron", Tibesti, Chad, during the Late Pleistocene". Global and Planetary Change. 72 (4): 334–340. Bibcode:2010GPC....72..334S. doi:10.1016/j.gloplacha.2010.05.004. ^ Maley, Jean (2000). 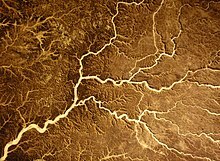 "Last Glacial Maximum lacustrine and fluviatile Formations in the Tibesti and other Saharan mountains, and large-scale climatic teleconnections linked to the activity of the Subtropical Jet Stream". Global and Planetary Change. 26 (1–3). Bibcode:2000GPC....26..121M. doi:10.1016/S0921-8181(00)00039-4. ^ Tourte, René (2005). Histoire de la recherche agricole en Afrique tropicale francophone [History of agricultural research in French tropical Africa] (in French). Volume I: Aux sources de l'agriculture africaine: de la Préhistoire au Moyen Âge. Food and Agriculture Organization. p. 11. ISBN 978-92-5-205407-8. ^ Messerli, B. (1973). 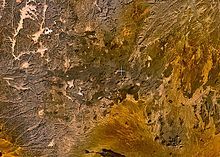 "Problems of vertical and horizontal arrangement in the high mountains of the extreme arid zone (central Sahara)". Arctic and Alpine Research. 5 (3): A140. ISSN 0004-0851. JSTOR 1550163. ^ a b "Climate Data for Latitude 21.25 Longitude 17.75". Global Species. July 28, 2011. ^ a b c d e f g h i j k l m n o p "Présentation". Zouar.net. Archived from the original on October 22, 2011. ^ a b c d e f g h "Tibesti-Jebel Uweinat montane xeric woodlands". Terrestrial Ecoregions. World Wildlife Fund. ^ Giazzi, Frank (1996). La Réserve Naturelle Nationale de l'Aïr et du Ténéré (Niger) : la connaissance des éléments du milieu naturel et humain dans le cadre d'orientations pour un aménagement et une conservation durables : analyse descriptive [The National Nature Reserve of the Aïr and Ténéré (Niger): The elements of the natural and human environment within a framework of sustainable conservation management: descriptive analysis] (in French). International Union for Conservation of Nature. p. 179. ISBN 978-2-8317-0249-0. ^ a b c d e f White 1998, p. 243–244. ^ a b c Getty Doby 2007, p. 11. ^ Hogan, C. Michael (January 31, 2009). "African Wild Dog". GlobalTwitcher.com. Archived from the original on September 21, 2013. ^ Tilho, Jean (1920). Carte provisoire de la région Tibesti. Borkou, Erdi, Ennedi, (mission de l'Institut de France, 1912–1917) (Map). Service géographique de l'armée. ^ Getty Doby 2007, p. 31. ^ "Bardai Zougra Airport". Airports Database. ^ a b c d e Chapelle 2004, p. 69. ^ a b c Chapelle 2004, p. 2, 6. ^ a b c d e f g h i Chapelle 2004, p. 70. ^ a b c d e f g h i Chapelle 2004, p. 72–79. ^ Baroin, Catherine (1985). 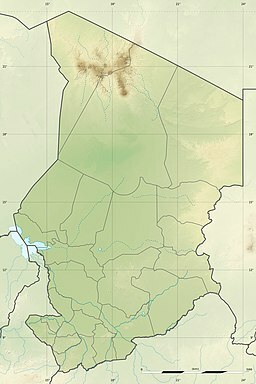 Anarchie et cohésion sociale chez les Toubou: les Daza Kéšerda (Niger) [Anarchy and social cohesion among the Toubou: Daza Kešerda (Niger)] (in French). Editions de la Maison des sciences de l'homme. ISBN 978-2-7351-0095-8. ^ a b Chapelle 2004, p. 38. ^ Chapelle 2004, p. 4–5. ^ a b Chapelle 2004, p. 30–31. ^ a b Chapelle 2004, p. 36–37. ^ "Le Tibesti". Visiter le Tchad. Archived from the original on May 2, 2012. ^ Chapelle 2004, p. 34–35. ^ Chapelle 2004, p. 81–82. ^ a b c d "Chad: Toubou and Daza: Nomads of the Sahara". A Country Study: Chad. Library of Congress. LCCN 89600373. ^ a b Chapelle 2004, p. 41–44. ^ Chapelle 2004, p. 79–81. ^ a b c d e Chapelle 2004, p. 64. ^ a b c d e Permenter and Oppenheimer 2007, p. 610. ^ a b Fearon et al. 2006, p. 4. ^ Fearon et al. 2006, p. 6. ^ a b c Fearon et al. 2006, p. 10. ^ a b c d "Teda, Toubou, Tubu". Zouar.net. Archived from the original on July 27, 2011. ^ Claustre, Pierre (1990). L'Affaire Claustre: autopsie d'une prise d'otages [The Claustre Affair: Autopsy of a hostage situation] (in French). Karthala. ISBN 978-2-86537-258-4. ^ Arsenault, Claire (September 6, 2006). ""La captive du désert" est morte" [The "captive of the desert" is dead] (in French). Radio France Internationale. Archived from the original on January 30, 2011. ^ Correau, Laurent (August 18, 2008). "1974–1977 L'affaire Claustre et la rupture avec Habré" [1974–1977 The Claustre affair and break with Habré] (in French). Radio France Internationale. Archived from the original on March 16, 2012. ^ Fearon et al. 2006, p. 11. ^ a b Higgins, Rosalyn (July 2, 1993). "The Reactions of Chad to the Libyan Occupation" (PDF). Public sitting held on Friday 2 July 1993, at 10 a.m., at the Peace Palace, President Sir Robert Jennings presiding in the case concerning Territorial Dispute (Libyan Arab Jamahiriya/Chad). The Hague: International Court of Justice. p. 18. Archived from the original (PDF) on July 27, 2001. Retrieved March 18, 2015. ^ Fearon et al. 2006, p. 10–11. ^ Nolutshungu 1995, p. 327. ^ Nolutshungu 1995, p. 186. ^ Nolutshungu 1995, p. 188. ^ Nolutshungu 1995, p. 213–214. ^ Nolutshungu 1995, p. 214–216. ^ Pollack, Kenneth M. (2002). Arabs at War: Military Effectiveness, 1948–1991. University of Nebraska Press. p. 376. ISBN 978-0-8032-3733-9. ^ Nolutshungu 1995, p. 215–216, 245. ^ Chapelle 2004, p. 10. ^ a b c Baroin, Catherine (2003). Du sable sec à la montagne humide, deux terrains à l'épreuve d'une même méthodologie [Dry sand to damp mountain, two sites tested with the same methodology] (PDF) (in French). Université de Paris X - Nanterre. ^ Jäkel, Dieter (1977). "The Work of the Field Station at Bardai in the Tibesti Mountains". The Geographical Journal. 143 (1): 61, 66. ISSN 0016-7398. JSTOR 1796675. ^ Klitzsch, Eberhard H. (2004). "From Bardai to SFB 69: The Tibesti Research Station and Later Geoscientific Research in Northeast Africa" (PDF). Die Erde. 135 (3–4): 245. ISSN 0013-9998. ^ Permenter and Oppenheimer 2007, p. 609–610. ^ Gourgaud and Vincent 2004, p. 261–290. ^ University of Cologne (June 2, 2015). "Scientific Exploration of the Tibesti Mountains: Cologne Researcher Headed Mission to the Peaks of the Sahara Desert". Science Daily. Retrieved January 17, 2016. ^ a b c d e f Grande Encyclopédie 1979, p. 2264. ^ "Wilfred Thesiger (1910–2003)" (in French). Les Deserts. ^ "Emi Koussi". Peakware. Archived from the original on October 10, 2012. ^ a b Steele, P.R. (1964). "A Note on Tieroko (Tibesti Mountains)". Alpine Journal. 69 (308–309). ^ "Fastest time to climb the highest peaks in all African countries". Guinness World Records. ^ Fullen, Ginge (September 5, 2007). "Libya - Bikku Bitti". SummitPost.org. ^ Chamberlain, Gethin (January 17, 2018). "The deadly African gold rush fuelled by people smugglers' promises". The Guardian. Retrieved February 27, 2019. ^ a b Bangoura, Mohamed Tétémadi (2005). Violence politique et conflits en Afrique: le cas du Tchad [Political violence and conflict in Africa: the case of Chad] (in French). L'Harmattan. ISBN 978-2-296-00079-7. ^ Maoundonodji, Gilbert (2009). Les enjeux géopolitiques et géostrategiques de l'exploitation du pétrole au Tchad [The geopolitical and geostrategic issues of the exploitation of oil in Chad] (in French). Presses universitaires de Louvain. ISBN 978-2-87463-171-9. ^ a b c "Economie". Zouar.net. Archived from the original on July 27, 2011. ^ "Info voyage Tchad, séjour, circuit désert du Tchad, hôtels à N'djamena, Moundou, Sarh et Abéché au Tchad, parcs naturel Zakouma - l'ancêtre Toumai" [Chad travel info, holiday, around the Chadian desert, N'djamena hotels, Moundou, Sarh and Abeche in Chad, Zokouma National Park - the ancient Toumai] (in French). Tourisme en Afrique. Archived from the original on September 9, 2012. ^ Getty Doby 2007, p. 31–34. ^ Nicolazzi, Anthony (March 1, 2010). "Hommes et Montagnes signe son retour à l'Emi Koussi" [Men and Mountains sign his return to Emi Koussi] (in French). Trek Magazine. ^ Olimori (December 5, 2008). "Vers l'Emi Koussi" [Towards Emi Koussi] (in French). I-Trekkings.net. Archived from the original on January 27, 2013. ^ "Tibesti, Emi Koussi et lacs d'Ounianga" [Tibesti, Emi Koussi and lakes of Ounianga] (in French). Terres d'Aventure. ^ Beudels, Marie-Odile (January 30, 2008). "Chad". Royal Belgian Institute of Natural Sciences. Archived from the original on November 27, 2007. ^ Baseline Study C: Etude de l'état des instruments politiques, capacités institutionnelles et niveaux de sensibilisation en relation avec les changements climatiques et les aires protégées en Afrique de l'Ouest: Gambie, Mali, Sierra Leone, Tchad et Togo [Baseline Study C: Study of state policy instruments, institutional capacity and awareness levels in relation to climate change and protected areas in West Africa: Gambia, Mali, Sierra Leone, Chad and Togo] (PDF) (in French). United Nations Environment Programme. September 2009. Archived from the original (PDF) on 2013-05-21. ^ Rapport de mission: Prospections des zones prioritaires de conservation pour les Antilopes Sahélo-Sahariennes au Tchad, et identification de programmes de conservation/développement durable [Mission Report: Surveys of priority conservation areas for the Sahel-Saharan Antelopes in Chad, and identification of programs for sustainable conservation/development] (PDF) (in French). Bonn Convention. Archived from the original (PDF) on 2013-05-21. ^ a b Chapelle 2004, p. 27–28. ^ a b c d e Beauvilain 1996, p. 21–24. ^ a b c Getty Doby 2007, p. 13. ^ Getty Doby 2007, p. 14. ^ "Jean Verame" (in French). Encyclopedie Audiovisuelle De L'art Contemporain. Archived from the original on October 20, 2012. ^ "Jean Verame" (in French). JeanVerame.com. ^ "Bardaï Mue". Geo212. Archived from the original on January 29, 2012. ^ "Timbre: Head of sheep and Tibesti". Colnect.com. ^ Buzatti, Dino; Breitman, Michael (1984) . "Les Murs d'Anagoor". Les Sept messagers: nouvelles [The Seven Messengers: short stories] (in French). Union générale d'éditions. ISBN 978-2-264-00478-9.